New Jersey is a national leader with regards to installed solar PV capacity, with more than 2.7 gigawatts (GW) from nearly 104,000 individual solar PV installations. According to the Solar Energy Industries Association (SEIA), New Jersey is ranked 5th in the United States for totaled installed solar PV capacity, behind California, North Carolina, Arizona, and Nevada. New Jersey is ranked 1st on a total installed solar PV capacity per square mile basis; demonstrating New Jersey’s commitment to solar energy despite the state’s limited geographic footprint. 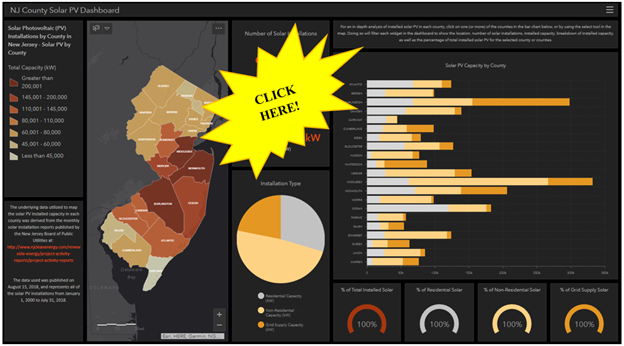 Click the image below to launch an interactive dashboard to view and analyze the installed solar PV capacity in each of New Jersey’s counties. For more information, visit the NJ Board of Public Utilities solar reporting website. On July 23, 2012, L. 2012, c. 24 (Solar Act) was signed into law by Governor Chris Christie. The Solar Act amended certain aspects of the statute that governs the generation, interconnection, and financing of renewable energy and mandated that 4.1% of electricity sales must come from solar by 2028. On May 23, 2018 Governor Murphy signed the Clean Energy Act P.L.2018, c.17. The Act updates and accelerates the solar requirement to and establishes a Community Solar Energy Pilot Program. The Solar Act & Clean Energy Act requires the New Jersey Board of Public Utilities (Board or BPU) to conduct proceedings to establish new standards and to develop new programs to implement the acts overall goals to stabilize the solar market and continue growth in the solar industry. To encourage solar on underutilized lands, Subsection t. of the Solar Act (N.J.S.A. 48:3-87 (t)) is a program established by BPU to provide Solar Renewable Energy Credits (SRECs) to owners of solar electric power generation facilities certified as being located on a brownfield, area of historic fill, or properly closed sanitary landfill facility. Subsection t. applications are submitted to the BPU and, in consultation with the NJDEP, the Department provides a recommendation to BPU with respect to whether or not the proposed facility is located on a brownfield, area of historic fill, or properly closed sanitary landfill facility. Brownfield - any former or current commercial or industrial site that is currently vacant or underutilized and on which there has been, or there is suspected to have been, a discharge of a contaminant. Area of Historic fill - generally large volumes of non-indigenous material, no matter what date they were emplaced on the site, used to raise the topographic elevation of a site, which were contaminated prior to emplacement and are in no way connected with the operations at the location of emplacement and which include, but are not limited to, construction debris, dredge spoils, incinerator residue, demolition debris, fly ash, and non-hazardous solid waste. Properly closed sanitary landfill facility - a sanitary landfill facility, or a portion of a sanitary landfill facility, for which performance is complete with respect to all activities associated with the design, installation, purchase, or construction of all measures, structures, or equipment required by the Department of Environmental Protection, pursuant to law, in order to prevent, minimize, or monitor pollution or health hazards resulting from a sanitary landfill facility subsequent to the termination of operations at any portion thereof, including, but not necessarily limited to, the placement of earthen or vegetative cover, and the installation of methane gas vents or monitors and leachate monitoring wells or collection systems at the site of any sanitary landfill facility. For further Subsection t information and application materials please visit the BPU Webpage. On February 19, 2019 the Community Solar Energy Pilot Program Rule was published in the New Jersey Register. BPU’s Community Solar Energy Pilot Program will enable utility customers to participate in a solar energy project that is remotely located from their property. The application window will open April 9, 2019 and close September 9, 2019. Learn more at the BPU’s Community Solar webpage here. To support the Community Solar Energy Pilot Program the Bureau of Energy and Sustainability has developed a Community Solar PV Siting Tool to help solar developers, municipalities and interested stakeholders find locations to site community solar arrays. Visit our Solar Siting webpage to learn more. Solar Siting Analysis: In 2017 the New Jersey Department of Environmental Protection’s (NJDEP) Bureau of Energy and Sustainability released a Solar Siting Analysis (SSA) Update. This report identifies sites where the Department would encourage solar installations from those where the Department would discourage solar installations based on their land use and characteristics. Learn more at our SSA webpage here. Solar On Landfill Guidance Document: The NJDEP Solid & Hazardous Waste Management Program has released a document entitled, “Guidance for Installation of Solar Renewable Energy Systems on Landfills in New Jersey” which is available for download here. This document will help guide developers through the process of obtaining the necessary NJDEP permits for installing a solar array on a properly closed landfill in New Jersey. US EPA RE-Powering America’s Land Initiative: EPA is encouraging renewable energy development on current and formerly contaminated land and mine sites when it is aligned with the community’s vision for the site. This initiative identifies the renewable energy potential of these sites and provides other useful resources for communities, developers, industry, state and local governments or anyone interested in reusing these sites for renewable energy development. Guidance on Re-Powering America’s Lands Initiative’s plans, incentives, mapping tools, site data, success stories and training events can be found here.